Apollo Group, Inc. (APOL), best known for its University of Phoenix college, is providing an example of how to trade the Demark TD Setup. I’ve been following APOL for about a year, waiting for it to fall far enough below my Intrinsic Value estimate ($68.7) and give a sufficient margin of safety. 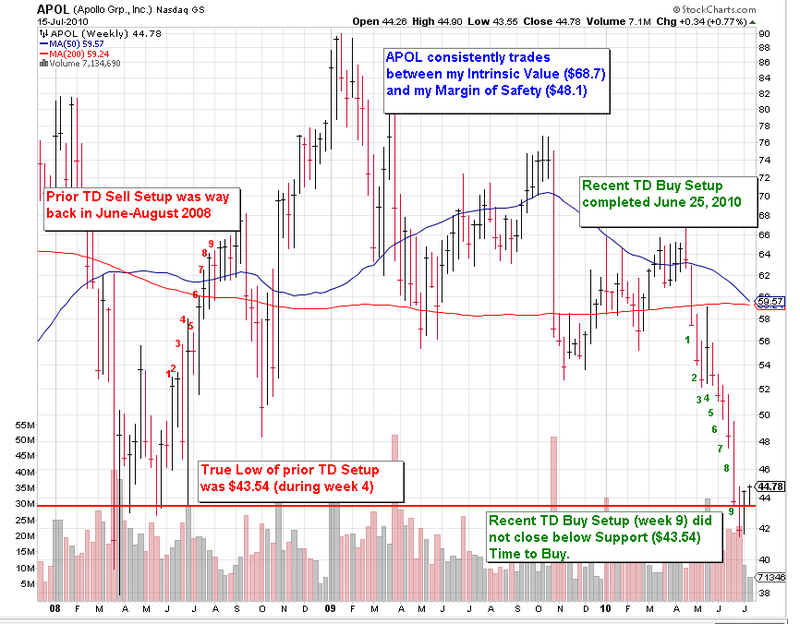 It fell below my margin-of-safety price ($48.10) the week of June 25th, and formed a TD Setup Buy in doing so (9 weeks, each weekly close lower than that 4 weeks prior). The first inclination after a Setup is to follow through to the more well known TD-Sequential process, where you continue into a 13 period countdown, waiting to purchase until the Countdown process is completed. But Setups can be traded on their own, and the rules for doing so – indicate this is an opportune time to buy APOL. When a Buy Setup is completed, we check the prior Sell Setup for the Support level. If Support was not broken, and the close is in close proximity to support, then we buy the Setup. Understand? The chart below should help. I purchased APOL today at $46.03. On a day like today where around 9 out of 10 stocks were lower (Dow down over 2.5%, 261 points), APOL was a standout to the upside, being up almost 2% on the day. Very unusual strength. That’s the power of these Demark momentum exhaustion techniques. When all the sellers have sold, the stock will go up due to the new buyers – who show up even on a day when the whole market is down. I’m using Demark to help me gain better entries on Value stocks. A stock has to give me a Margin of Safety (and be a predictable generator of Free Cash Flow) before I will begin tracking it for purchase. With this I am generally a longer term investor, whereas Demark is for shorter term traders. I plan to hold APOL until the market again recognizes it’s Intrinsic Value. 1) I’m a little unsure about the week after the Setup was completed (the 10th week of the Buy Setup) which did close below Support. Does that mean I should wait until a TD-Sequential is completed? I don’t think so, and the bullish nature of APOL today gave me some comfort. If you are reading this and you happen to know the correct Demark call on this, please email me. Technically, the stop-level on this trade would be around $38 (Low of Setup minus it’s range). 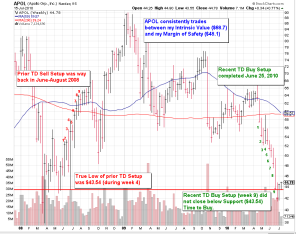 APOL is trading near it’s 3-year low, and I’m satisfied with my purchase price. I don’t think I’d sell even if it falls below $38. This would only mean I was wrong, and should’ve waited for a completed TD-Sequential – so I’d learn something. But it would also represent an even deeper value on a cash-generating value stock, and following the rules of Buffet and other value investors, that means I should buy more.